Welcome to the biggest article on the site. 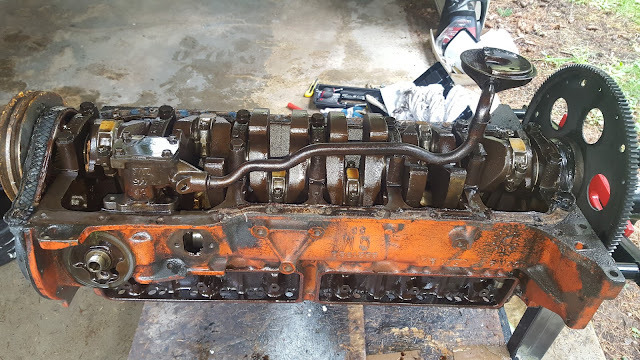 Rather than writing a massive narrative on how to rebuild an engine, wait as the 30+ pictures and videos load and work your way down, reading the captions as you go. It sure beats a wall of text. If you don't care about the captions, you can click to zoom any image and then scroll through them all as a slideshow. Once it was decided the engine project was starting, the first step was to pull off all the "easy" parts such as the radiator, alternator, distributor, power steering pump, fan and any connected wiring. You might as well pull the engine before reaching for the fuel pump or starter. 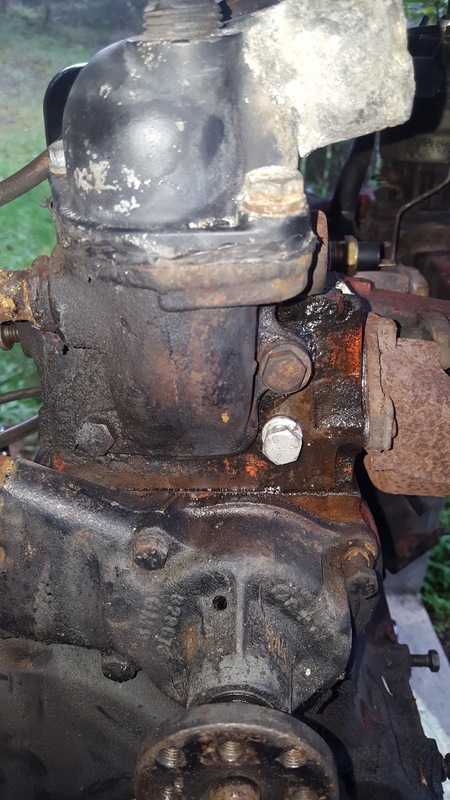 Starter solenoid was rebuilt in 2015. 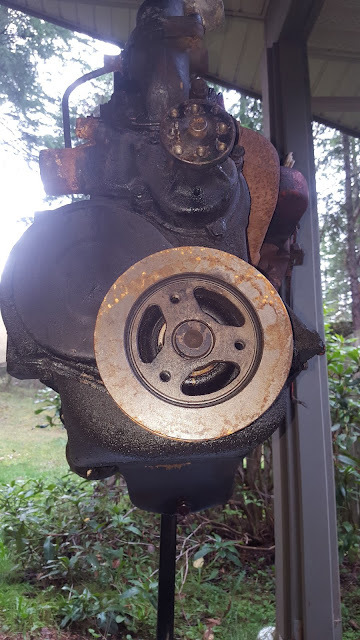 Head unbolted. Hard to do with the engine stand on wheels as those bolts are tight. Connecting rods unbolted and pulled out of the top of the block with pistons. the original rod. The stock rods are forged and will be reused. it. Loosely bolt the caps back in their original spots for transport to the machine shop. 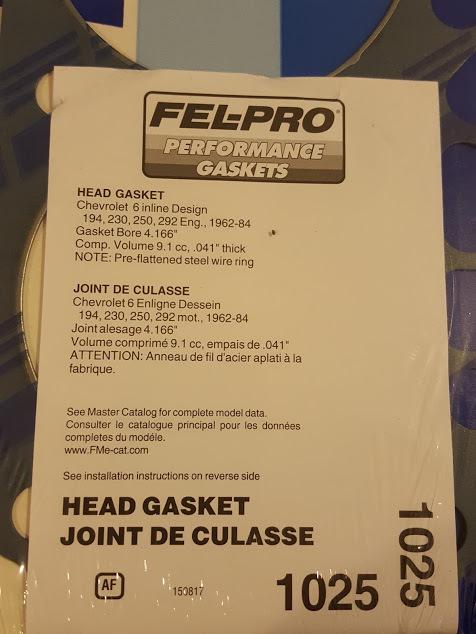 Felpro Performance head gasket for racing and turbocharged applications. 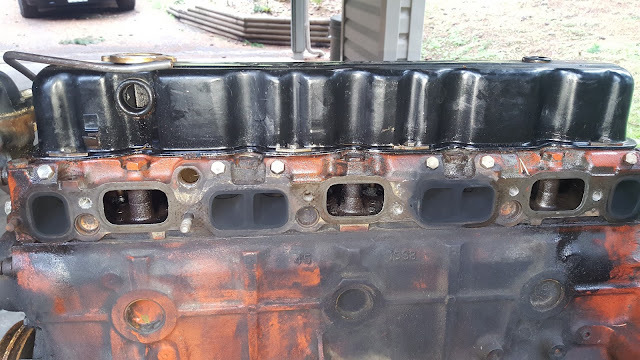 couple performance head gaskets available, it's unavoidable. With the engine completely dismantled, the block, crank, cam, pistons and connecting rods were lightly cleaned and brought to the machine shop. Check you the associated Machine Shop article for more information on what's happening there. The parts are expected to be ready for pickup in March 2016. The machine shop quickly advised the 0.060" oversized cylinders were very usable and even larger oversized pistons could be used. 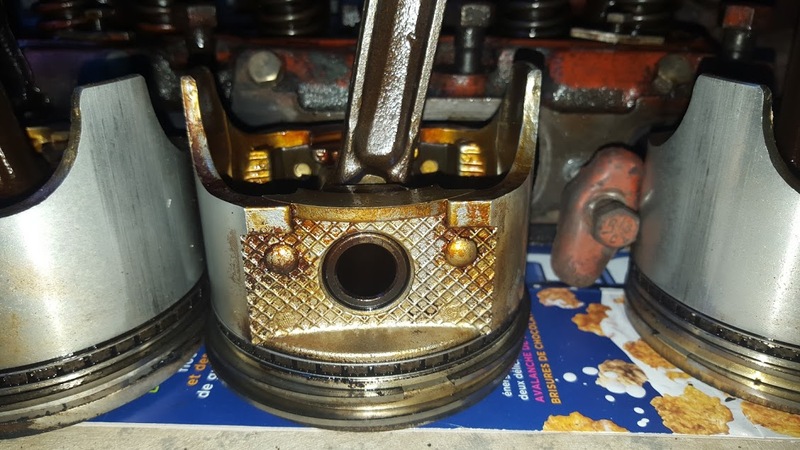 Take a look at the Pistons article for more information. 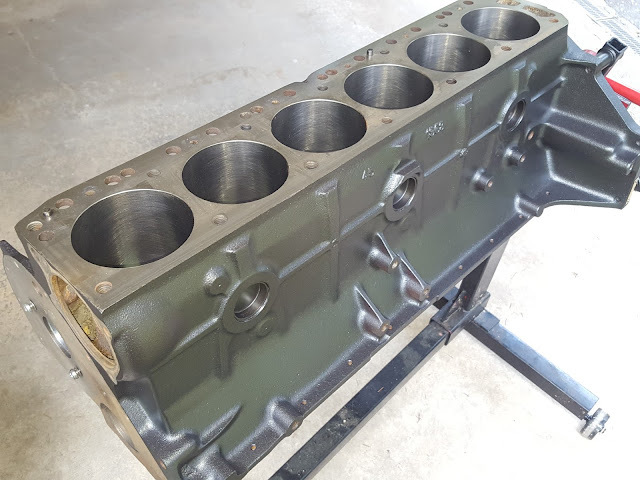 Custom oversized pistons were ordered. Since the waiting game had started, it was a good time to clean and prep all the left over parts. The motor mounts, damper. 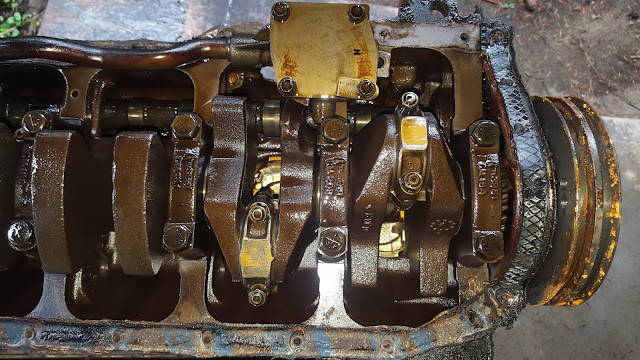 fan, starter, water pump, thermostat housing, power steering pump, alternator, timing cover, oil pan, manifolds, valve cover, cylinder head and carburetor all need attention. 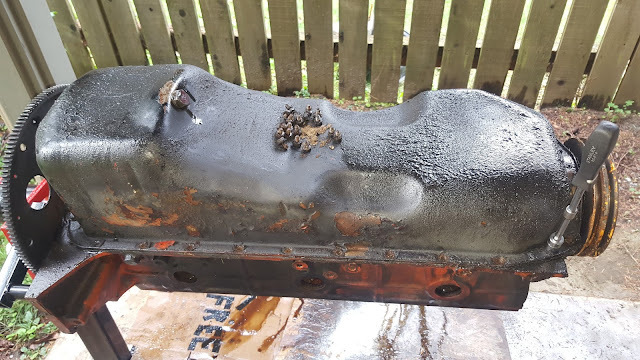 Of course you don't have to paint them all, but you should clean them up and be sure all mating surfaces are ready for reassembly. Keep in mind, if prepped and painted properly, the paint can help protect the parts and keep your engine looking fresh. All of the above parts were thoroughly cleaned and most of them painted with different VHT paints. On March 18 2016, the parts were picked up from the Machine shop and brought home. 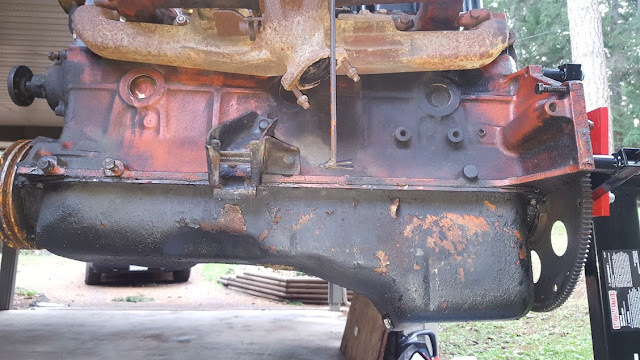 The block had been done for a while so it had accumulated a bit of surface rust. The block was checked for extra slag and casting before it was sanded, cleaned and painted with VHT Metallic Black Pearl. The process was filmed and posted here. With most of the components painted, the short block parts were gathered and assembly started. 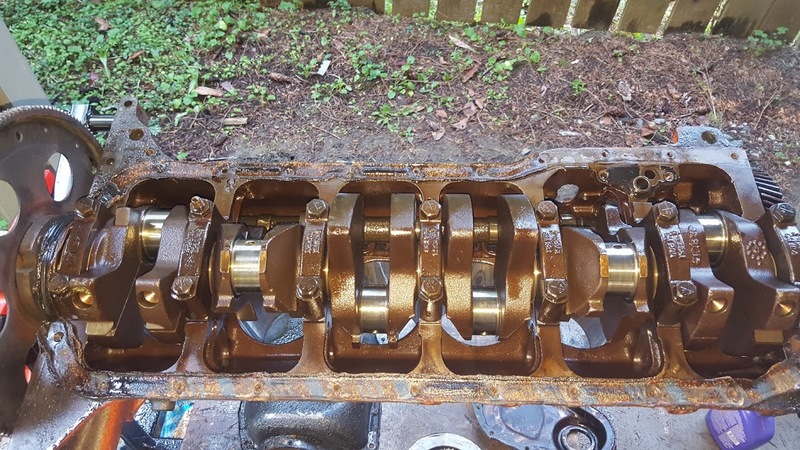 Watch the following video to see bearings, crankshaft, rods, pistons and camshaft installed. Unfortunately some of the video was lost, but it ends with a sneak peak of the engine installed in the car. 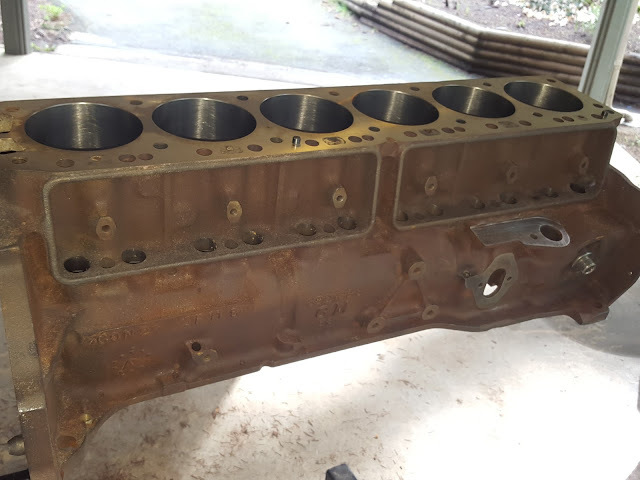 With the short block assembled, the cylinder head needed attention. 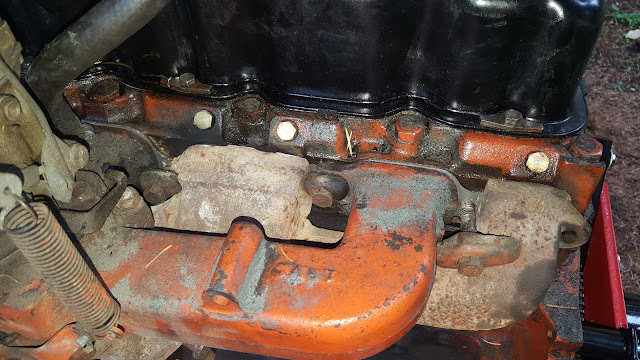 It was cleaned and 12bolt.com's lump port kit was installed. 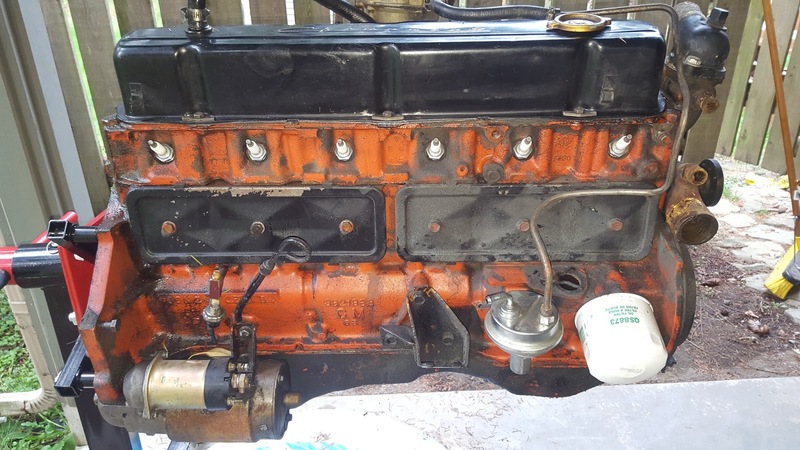 With the intake ports lumped and ported, the head was cleaned again and painted with the same VHT paint as the block. 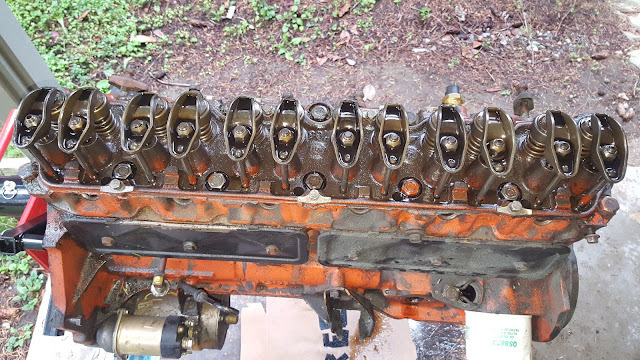 Since we used a bigger camshaft, larger valve springs were needed. We installed a modification free performance valve spring and retainer kit from 12bolt.com. Videos of all head work were filmed and posted in the appropriate build sheet category and on Youtube. The head was then bolted onto the block using the Felpro 1025 head gasket (picture shown above). The performance gasket has a reputation to handle high power turbo and supercharged applications. Claims of 250's and 292's exceeding 1000HP with the above gasket have been made. With most of the long block assembled, it was time to bring the engine home. 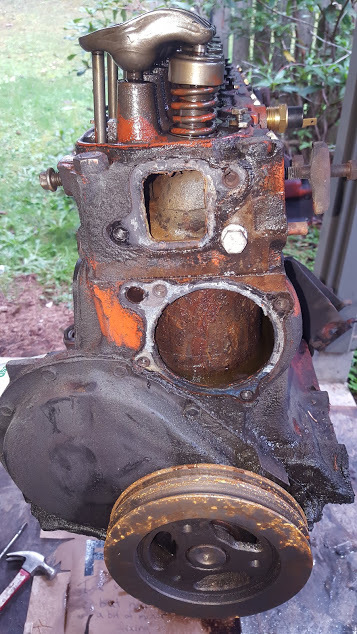 An engine hoist was rented for about $30 and in about an hour the engine was back in the bay. 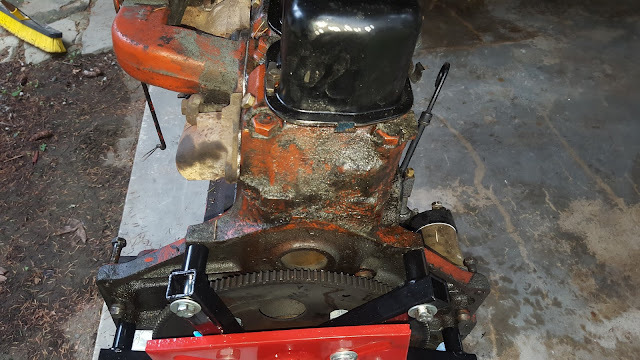 The motor was pulled by separating the flexplate from the torque converter. 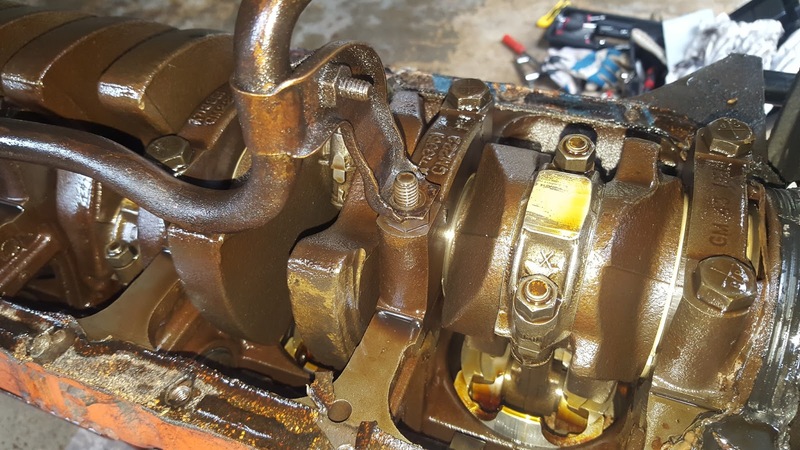 The Turbo 350 transmission had a shift kit installed last year so there was no need to pull it with the motor. 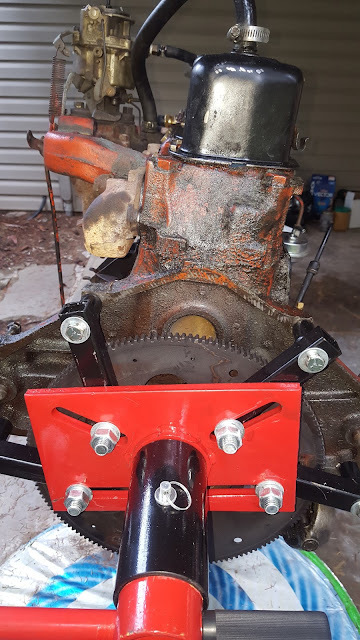 The motor mount bolts were shabby but a quick trip to the hardware store solved that. New spacers were created out of a piece of pipe. 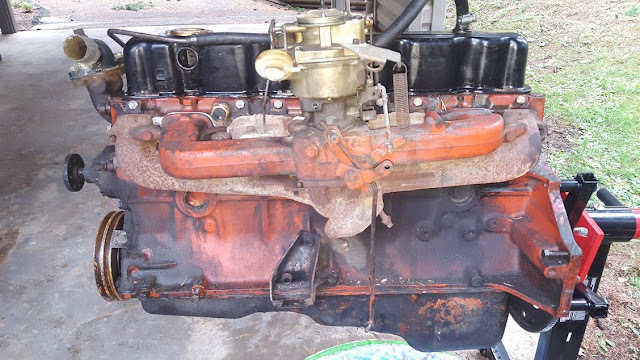 That pipe, the fuel pump and the carburetor are the only parts that didn't get painted. The bolts connecting the block to the transmission are difficult to get started but a ratcheting box end wrench makes short work of the limited space. The block wasn't the only part painted. 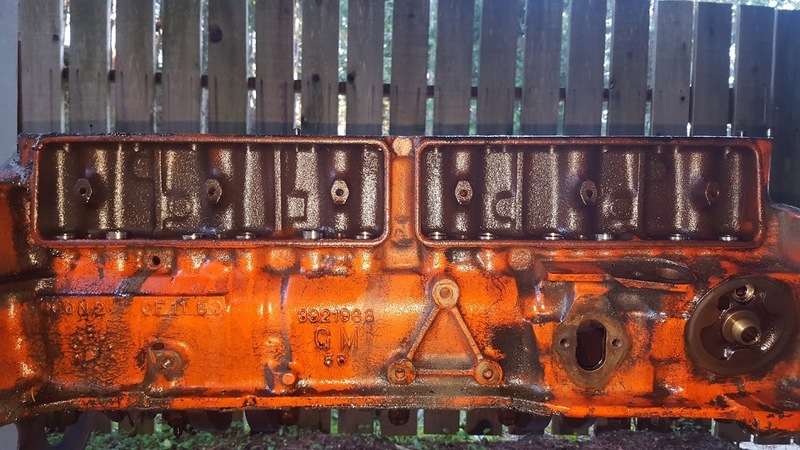 The Offenhauser script was finger painted on. 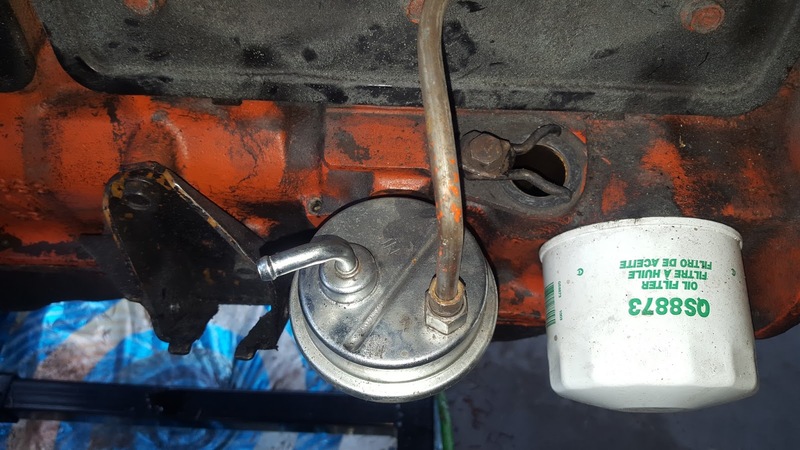 The oil fill cap was replaced with a Spectre chrome breather and the PCV was replaced with a matching chrome Spectre PCV. 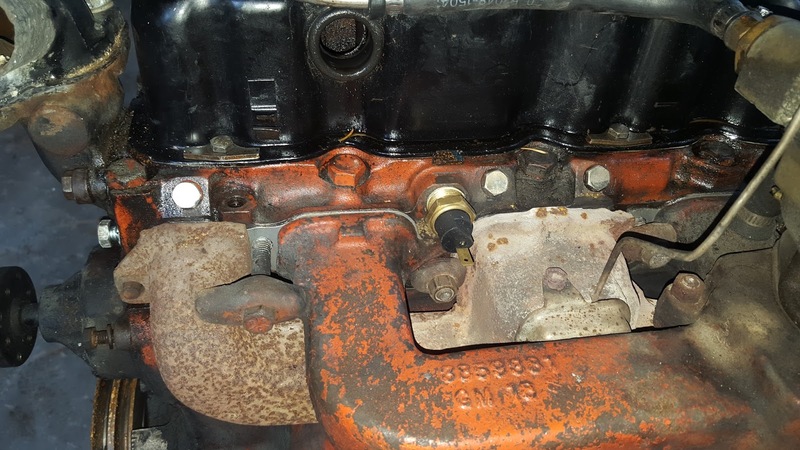 This is a good picture to notice the lack of modern carb adapter plate on the manifold. 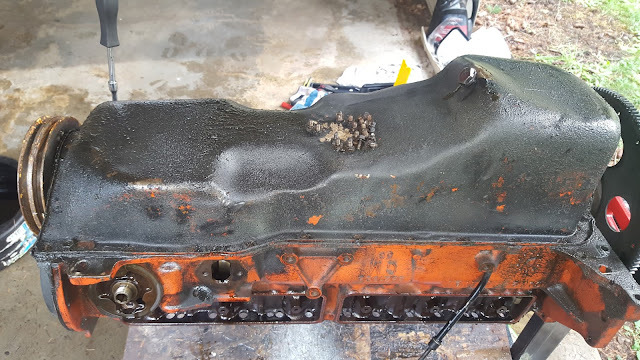 The intake manifold, an Offenhauser 5416 and the Chevy 292 exhaust manifold do not come as a factory unit so they do not always mesh well. Be sure to mock up your build prior to paint and final assembly as you will likely need to grind here and there to make things fit. A 2 part video series was filmed regarding the fitment of the manifolds and parts required to fit the carburetor. The manifolds are painted and torqued to the head. 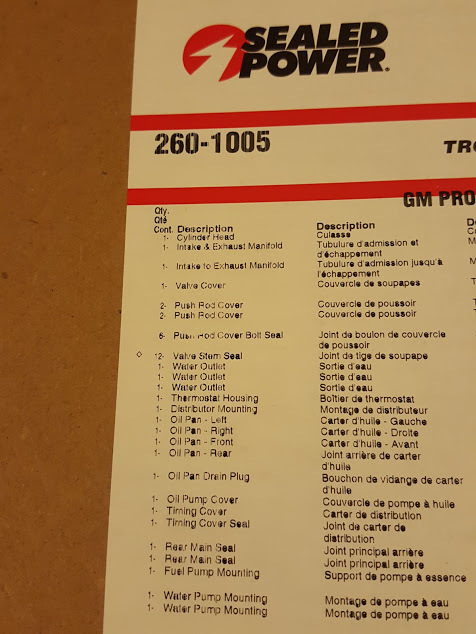 We had to wait almost a week for the 1/2" carb spacer and Trans-Dapt 2090 adapter plate. Both the spacer and adapter were required to mount the more modern Holley 4776 4 barrel carburetor. 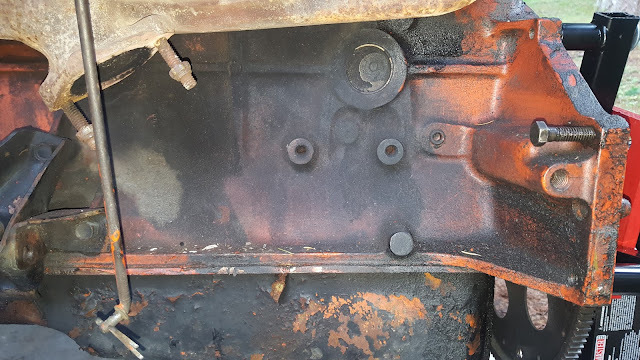 If your Offenhauser 5416 already has the plate, you'll just need the spacer for the throttle linkage to clear the intake flange. The final manifold setup was fairly simple but seemed to take forever to get right. 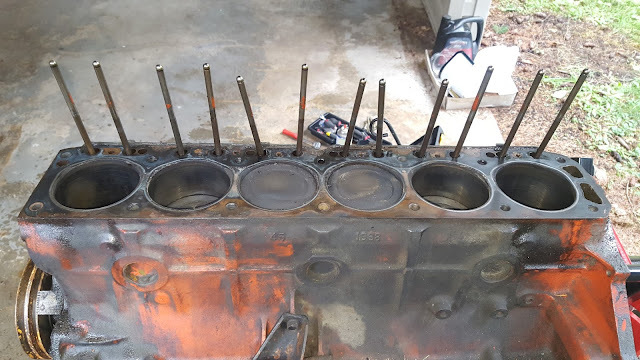 Offenhauser 5416, gasket, Trans Dapt 2090 adapter, gasket, black 1/2" phenolic spacer, Holley 4776 carburetor, ring gasket and finally a Spectre 9849 Plenum. 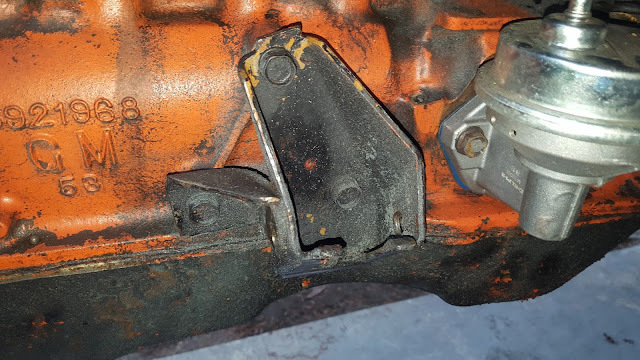 With all this there is only about a 1/2" for hood clearance but it's enough to get a wing nut up there to hold it all together. 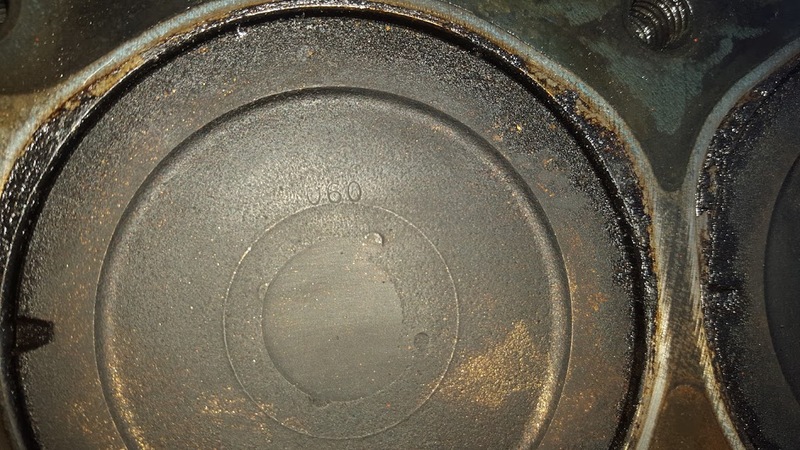 The initial timing was set for TDC and the distributor loosely clamped down. 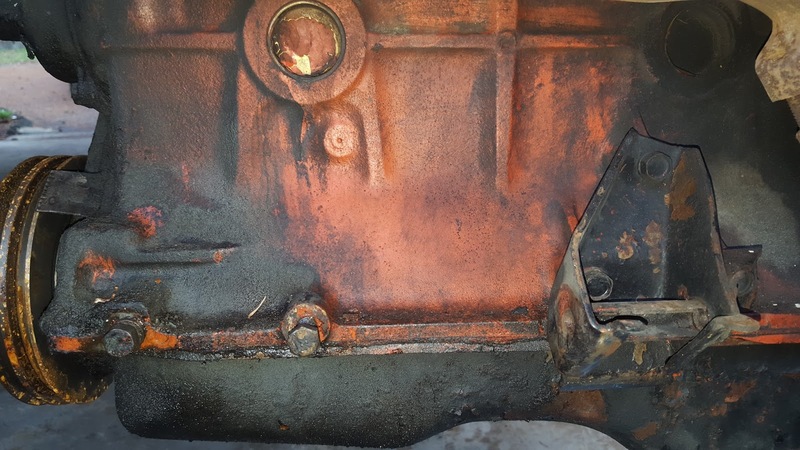 Radiator reinstalled and all associated hoses and fittings secured. 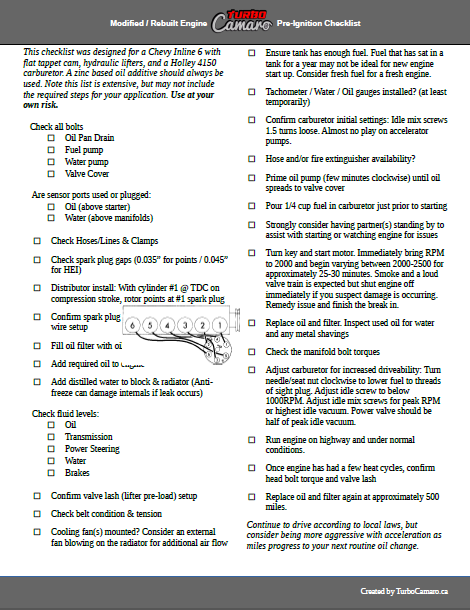 We created this Chevy 250 build specific engine pre-ignition checklist. 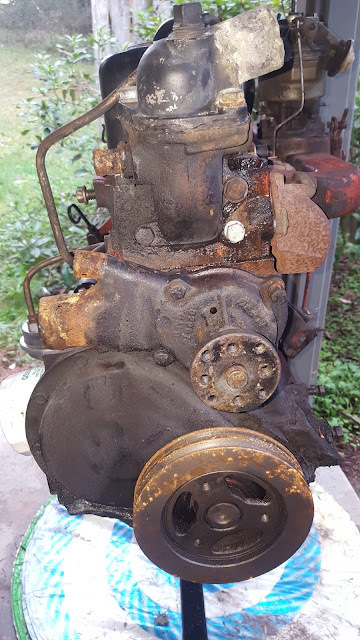 Download it here and check the boxes before you break in your new engine. All the hoses, lines, belts and bolts were installed and everything looked ready for final inspection. Using the check sheet shown above, everything was deemed ready for ignition. The inspection was filmed and posted below. Part 2 of the above video is posted below. 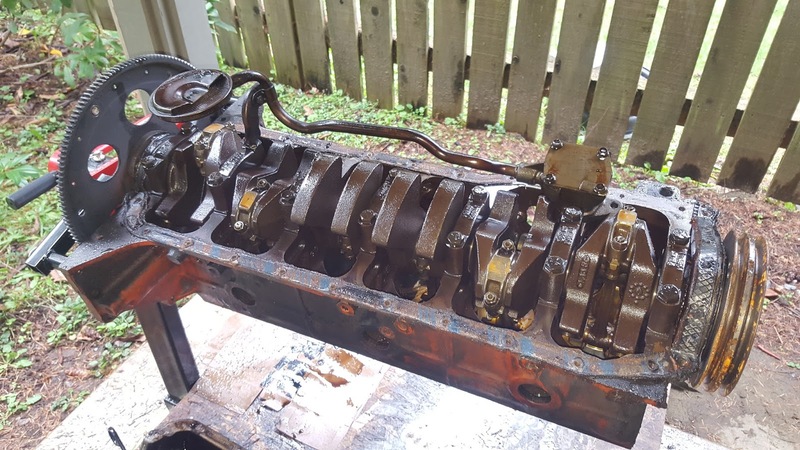 It's short, but goes through the troubleshooting process of a freshly rebuilt motor. Keep in mind We're not master mechanics, so it wasn't the smoothest start. 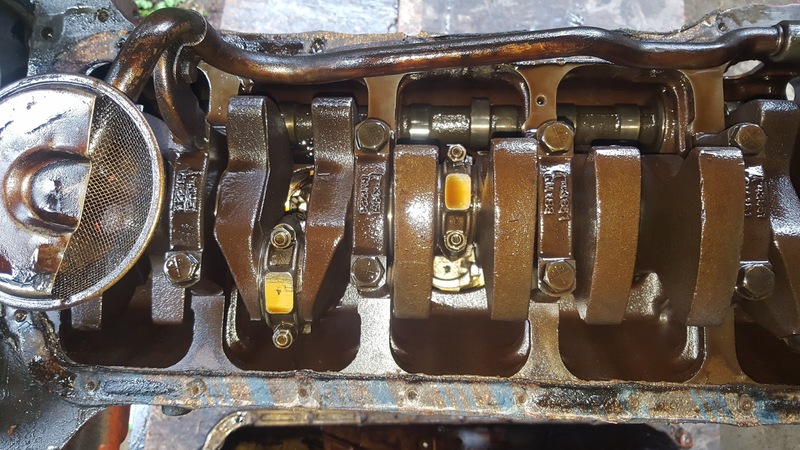 To expand on the video, other than a small coolant and fuel leak, the reason the car wouldn't start on the first attempt was a distributor timing issue. 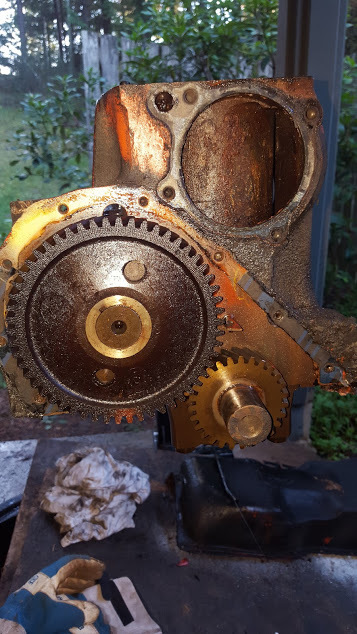 The timing was originally perfectly set slightly advanced of TDC but after the oil primer was used the distributor was dropped back in about 2 gear teeth from the desired position. 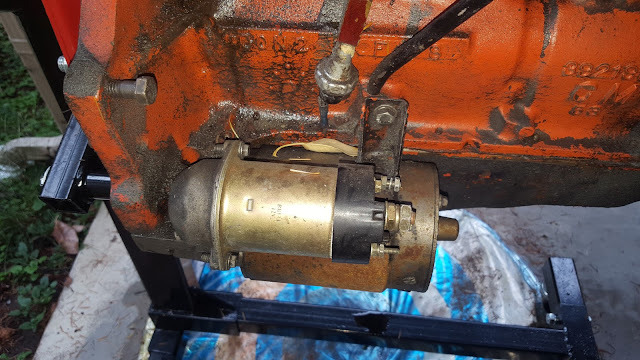 On top of that, the distributor was left loose to allow for adjustment but it was so loose the vibration from the attempted starts caused it to turn and put it ever further out. 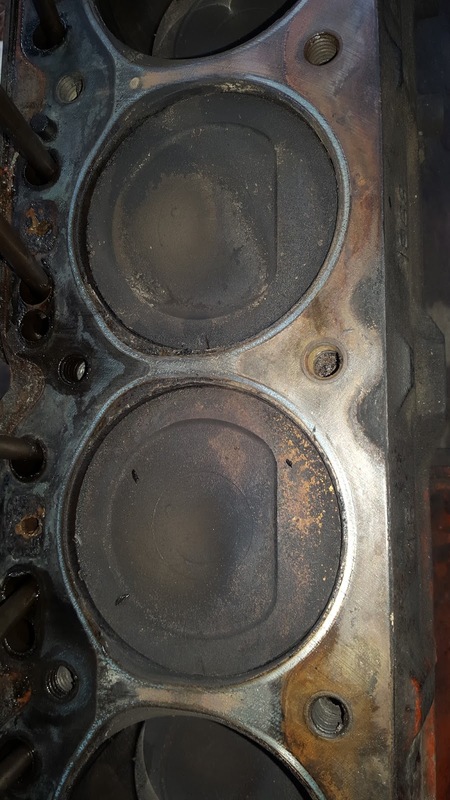 Once this was corrected completely (after attempt #3) the engine fired right up and was ready to break in. 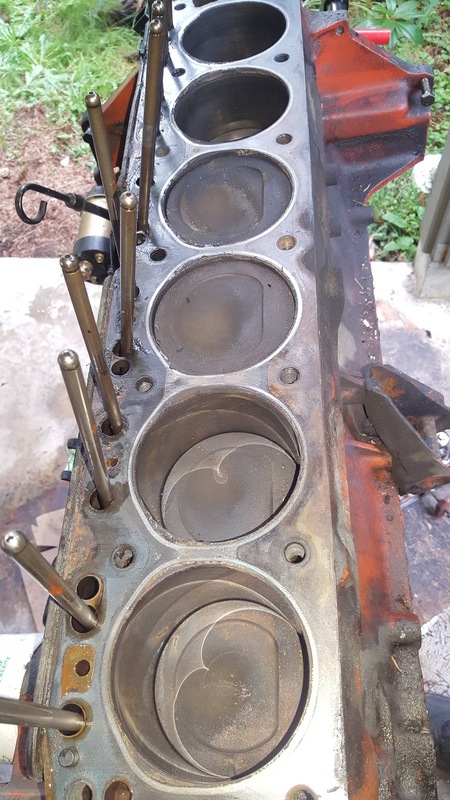 We completed about 30 minutes revving between 2500-3000 RPM. So, even though it took 4 attempts to start, it was fairly quick and turned out great. 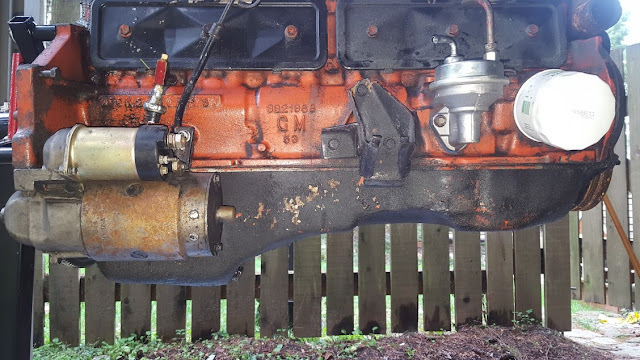 There will be a few things to adjust as the engine gets tuned but the rebuild and break in was a success and should provide a solid power plant for future alcohol injection and turbocharger upgrades.